OK, so Londonist is taking it easy like the rest of you, putting their feet up, spring-cleaning their keyboards, and eating indecent quantities of chocolate truffles. Just posting gentle fluffy things and useful stuff. But when we popped into Londonist Towers this morning, this story leaped out at us from the screen, begging to make it on to our column. Hey, it won’t do us any harm to keep our ranting facility well-honed, otherwise we’ll come back after the break full of saccharine and tinsel. Our yule-tide whinge pertains to Southwark council and a proposed demonstration of unmitigated stupidity. You see, Southwark council currently have one of the most efficient and impressive rubbish collection services in London. This Londonist lives and works in Southwark, and so she knows about these things. 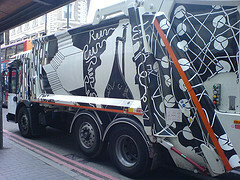 Not only are the bin men friendly, cheerful and helpful, but their rubbish carts are just the prettiest ever, as they have been turned into mobile works of art – brilliant idea, and we just love it. Our only worry about the whole system is the rather sinister environmental enforcement team (let’s just call them ‘the slashers’, although we’ve not actually seen the size of their knives) who creep around in the middle of the night and go through our bags like officious rodents just to check that we haven’t thrown the wrong kind of rubbish. Anyway, the point is that some twit at the town hall has decided to contract out the waste collection services for the borough. WHY TRY AND FIX SOMETHING THAT ISN’T BROKEN? Most everything else that gets contracted out ends up in a horrid mess (Apcoa immediately spring to mind). And so the bin men are quite rightly talking about striking. Now this Londonist doesn’t actually recall ever supporting any sort of industrial action before, so this is a personal historical moment. Good luck chaps. Pretty rubbish cart piccie courtesy of gwire’s flickr photo stream.